It’s time for the club’s annual Christmas party, potluck, and raffle! As always, there should be lots of good fun, good company, and a good raffle. Come see Keith’s beautiful new home, have lunch, and stay for the raffle. Husbands, wives, and friends are welcome, of course. It’s always a lot of fun, so please come! There’s a map attached to this newsletter, but call Keith if you get lost. It’s a true potluck, so bring a dish to share with the group. 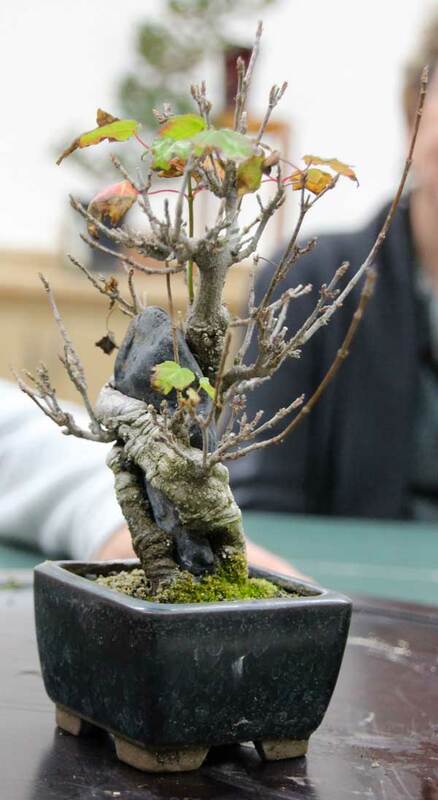 If you have anything bonsai-related to donate, please bring it. The proceeds go to the club treasury. There are no other club events until 2016. HAPPY HOLIDAYS to all! Our annual Christmas gathering is Sunday, December 20, at Keith Mautino’s new home. 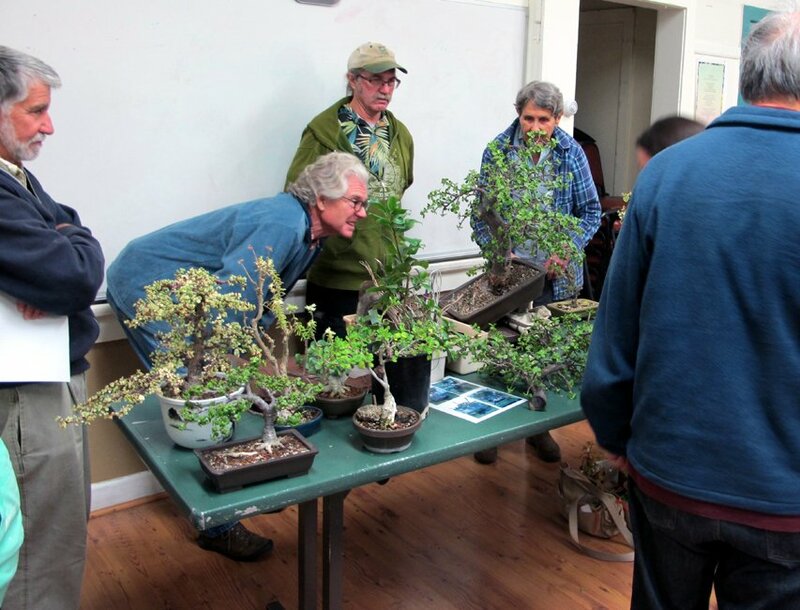 Keith says it is a great home for bonsai, so we are looking forward to our visit. It is a genuine Pot Luck, so bring your favorite dish. Yes, there is a raffle also. Anything bonsai related will be present. Of course, spouses and family are welcome. We will be having our end of the year Board Meeting at my house at 1:00, on Sunday, December 6. Board Members will give a short update on their positions, but everyone is welcome to come and voice their opinion on the various topics. Susanne’s presentation was both informative and amusing. Someone asked: Just what is a drought-resistant tree? The answer is one that only needs a little water every week or so at most and that will bring a smile to Goleta Water District or whoever provides your water. As you can see in the picture, it turns out that there quite a few plants which we haven’t traditionally grown and which may even seem strange to most of us, but that might fit the bill. For example here are a few: Portulacaria, some Ficus species, some Burseras, Jade Plant, Fockea, Operculicarya decaryi, and the list goes on. 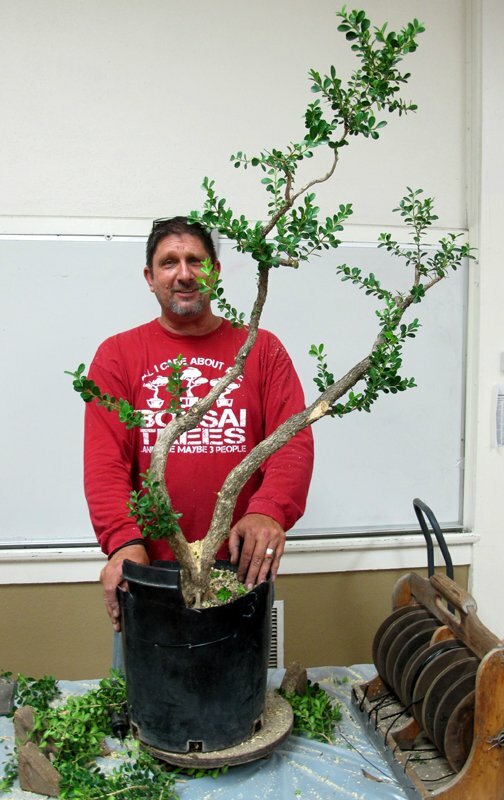 Susanne brought in a nice example of one of the more promising plants, the tall Portulacaria just to her left in the first picture, which she then turned over to the group to style. 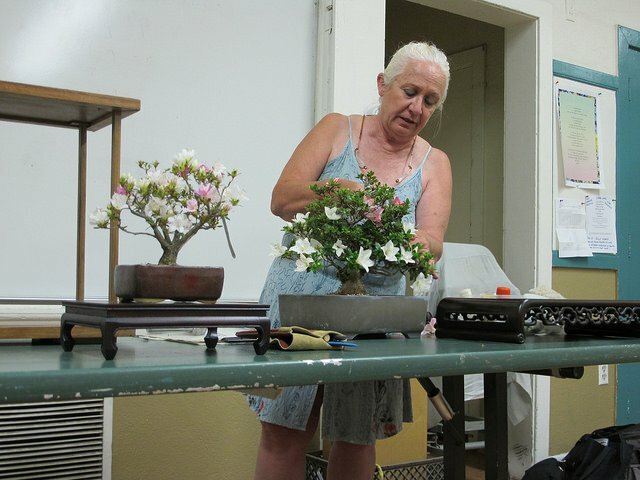 The second picture shows the “Bonsai by Committee” in progress, and the third picture shows an amused, or perhaps bemused, Susanne looking at the final result. I’m not sure just what she is thinking, but it must be either “This is a fine example of a future drought-resistant bonsai masterpiece” or “Oh well, this is exactly what you might expect when you have design by committee”. 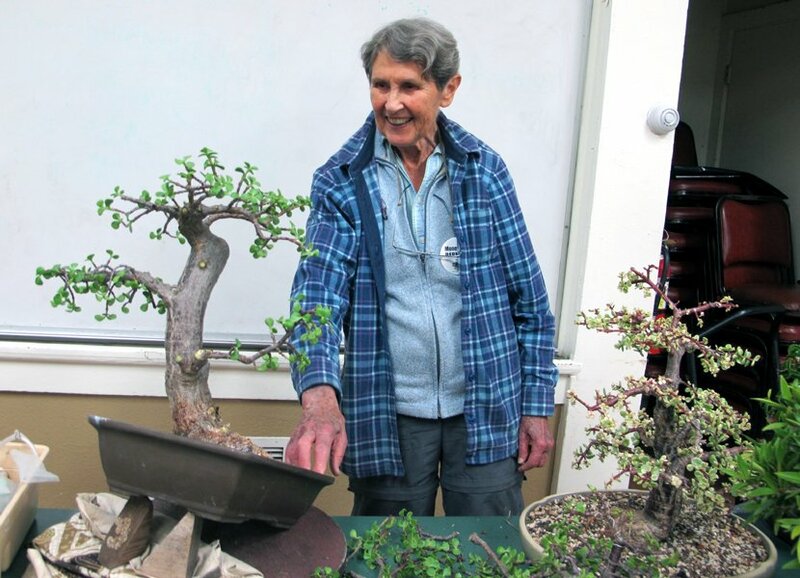 Each year Golden State Bonsai Federation’s Golden Statements Magazine has a contest to select the best club newsletter in two categories: Small newsletter, four pages or less; and large newsletter, over four pages. The winners were announced at the recent convention in Riverside. …and now, may I have the envelope please? Best Small Newsletter (are you ready for this? 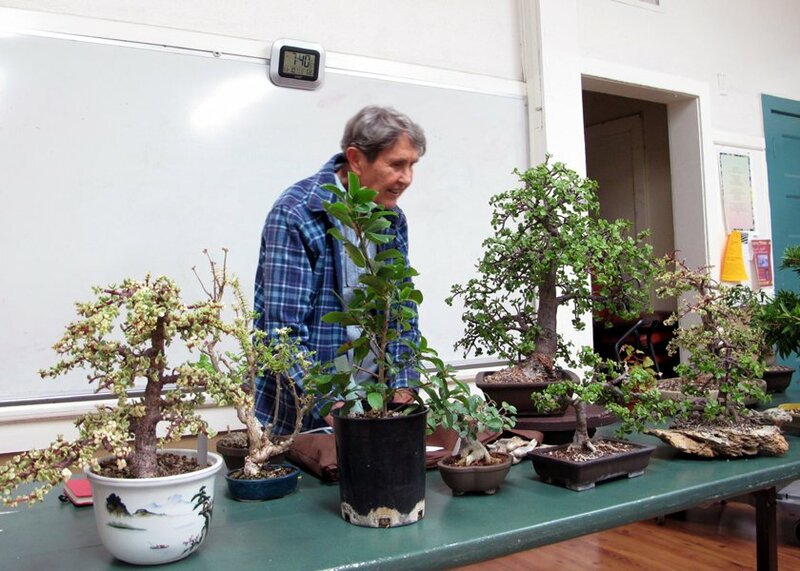 ): Bonsai Club of Santa Barbara. Editor: Joe Olson. I was extremely pleased that our club’s entry was chosen as a winner. Baiko-En Bonsai Kenkyukai’s Winter Silhouettes Show. Los Angeles County Arboretum and Botanic Garden, 301 N. Baldwin Ave., Arcadia. Ayers Hall. Hours 10 AM until 4:30 PM. 52nd annual celebration. Demos both days at 1:00 PM. 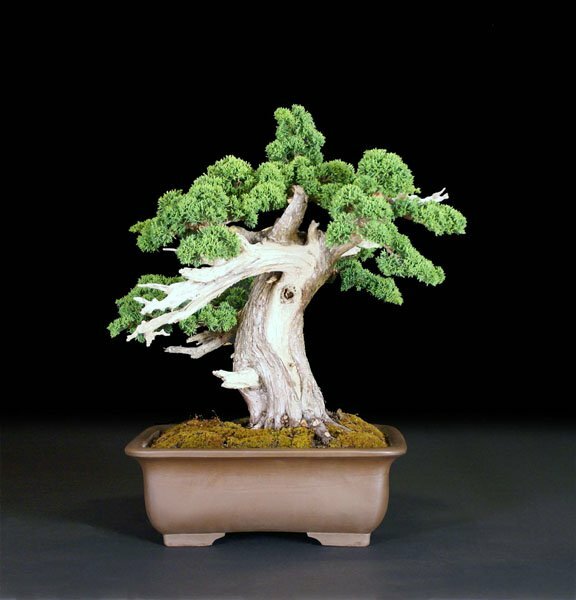 Bonsai material for sale. For information contact Lindsay Shiba at ljshiba@juno.com.